Are you looking to do a little something different in SL today? Why not go gallery hopping. We’ve put together a stylishly smart outfit for you to wear while mingling your way through the galleries. Let’s start today’s shopping at Le’La. Le’La’s group is NOT free to join. However, they do offer lots of of gifts to members of shopping groups that are free. We found Corys Outfit in the section of gifts for MLM Free&Offers members. The outfit comes in 5 fitmesh sizes, plus meshes for TMP, Curvy & Fine Beauty, eBODY, Slink, Maitreya, and Belleza. Our model is wearing the classic eBODY that costs 1L. We found the mesh for eBODY fit a bit too snugly around the hips for anyone using the thick alpha system to wear. But, the Maitreya mesh worked very well on the eBODY allowing a free range of motion without any unsightly body flashes. Though the jacket is slightly roomy around the back neckline, it fits great through the chest, back, and waist. 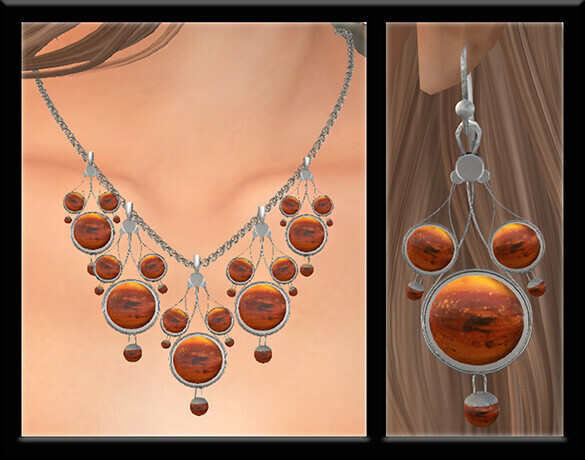 The Regal jewelry Set is a lovely group gift at EmmaKae. It comes in gold or silver and has a whopping 30 texture HUD for the stones. Our last stop is once again Hilly Haalan for these fabulous heels. 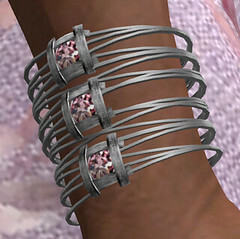 They are part of the Alaya Set, and are sized for Slink, Maitreya, and Belleza feet. Summer Winds Gallery is a scenic sim currently featuring an art exhibit from Alberto Lanteri.